With keen interest from across society, the results of the design competition “Commissioned Design and Construction Management of the Southern Branch of the National Central Library and the National Union Archives” were announced on August 30, 2018. Bio-architecture Formosana’s submission received a unanimous vote from committee members, earning the firm first place in the competition. The firm will work with Carlo Ratti, who Fast Company has said is “one of the 50 most influential architects in America” and who will add a more international feel to the creative design. Bio-architecture Formosana’s design was based on the concept “A library as a town.” They brought into the design big data analysis and AI smart technology to create in the library a place of knowledge and life. They desire to have the southern branch be a museum of public life there. In addition, the overall design emphasizes energy conservation and environmental protection, preserving 90% of the trees on the land and installing a solar panel canopy. This will be the first circulatory library in Taiwan. Director-general Tseng Shu-hsien stated, for this project NCL hired local and international experts in architecture and library & information science to be on the review committee. Not only were committee members concerned with the actual needs of National Central Library but also with how the design would meet the needs of the local population, be flood and earthquake proof, and incorporate smart energy and reduced carbon usage. It is hoped that the new complex will be in use in 2021, that this will create a new architectural landmark for southern Taiwan, and that this southern branch will become a standard for libraries internationally. 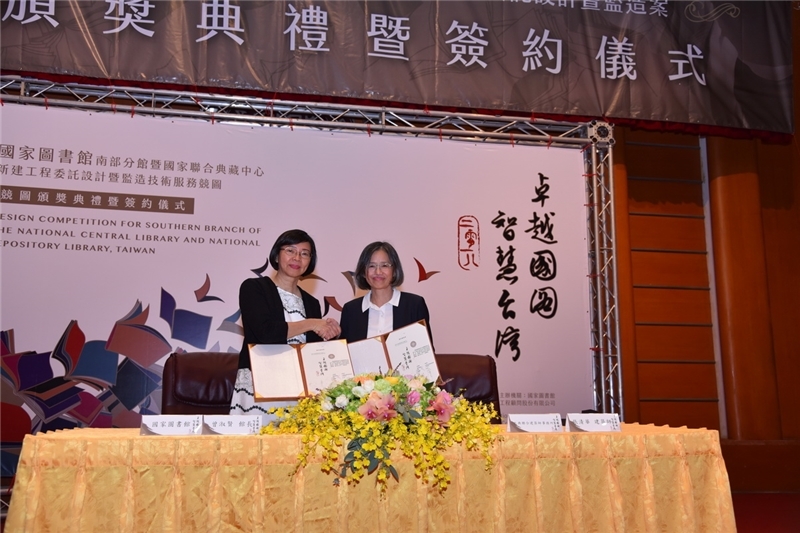 The contract for the construction of the Southern Branch of the National Central Library and the National Union Archives was signed on September 14 at 2:30 at National Central Library. The top five design models and images were on display at NCL from September 14 to 21. Posters showing the designs were also on display at the 6th exit of the Freedom Square metro station so that the public could also witness this historic moment and view the incredible designs by many talented firms. Bio-architecture Formosana’s model for the southern branch. 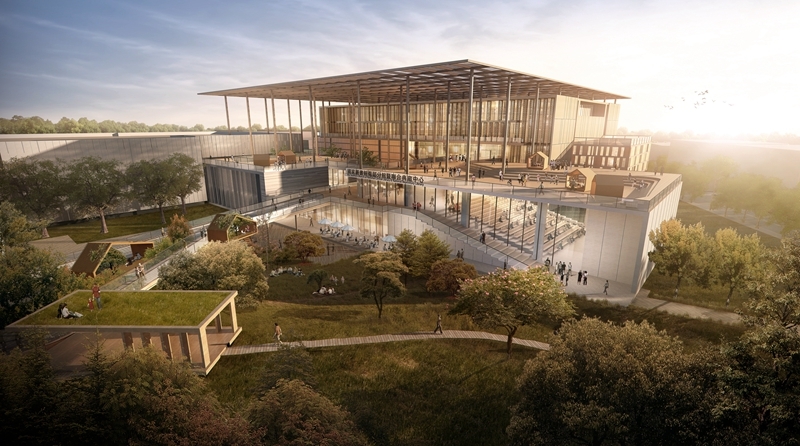 National Central Library and Bio-architecture Formosana sign a contract.